Meeting Yonnette Fleming is an experience unto itself. She appears as a woman, but her energy is like that of a whirlwind, bringing the spirits of our past into the creation of our future while nurturing the community by using her hands, her heart and the Earth. Yonnette is a native of Guyana, she arrived in the US at age 16. She says that she learned much of creation from her grandmother’s life. 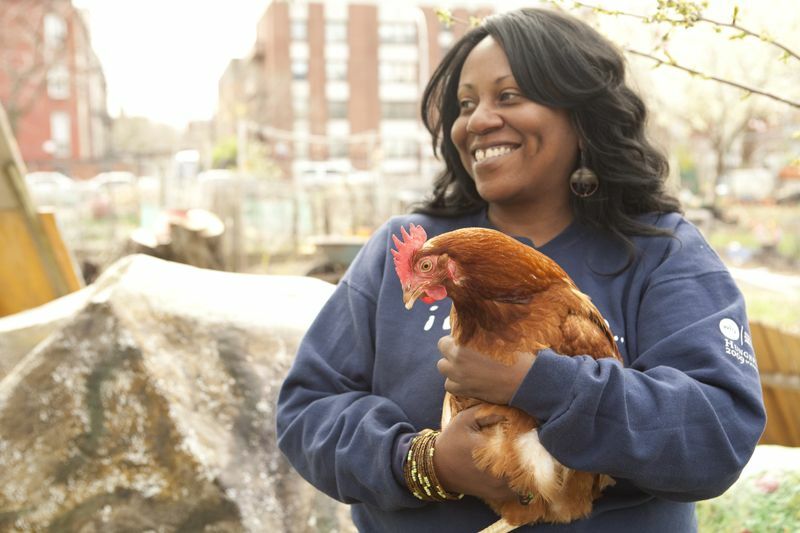 Before her name carried titles like “urban farmer” or “community Earth steward” or “food justice educator,” Yonnette was raising a family and working as a “corporate soldier.” The story of how she first connected with the Hattie Carthan Community Garden can be told no better than through her own words. “I want to speak to you about continuity and the migration of the African spirit. It goes wherever in the Diaspora where it is needed. Universal tensions draw it there. So, I want to state that as the universal template for how people move within the Diaspora. I was walking by the garden in 2003, and at that time I was a corporate soldier, walking by every day to go to work on the G train. But also, at the time, I was very centered in my Africanism. I was drumming intensely in a square called the Congo Square where my great-aunt struggled along with community leaders like Richard Green so that African people would have the freedom to congregate and sort their frequencies and vibrations together in one place in order to allow for some things to happen. So, my Africanism had already been a part of me. I was walking by the garden and I noticed that many things seemed to be needing support. Even the structures. There was a statue of a woman that was donated to the garden called The Khalif’s Favorite. This was one of my first projects I did in the garden. That statue was tipping over. It represented womanhood, and it was Black and the body was embodied and it had snakes on its head, and everything about it was so powerful, but it wasn’t being cared for or maintained. There was a need in the garden. But there was also a need in me to care for something, always. There was a need in me for community, a need to be at peace with the trees, a need for real food. There was a need in me, too. There was a need for me to move my gifts out of the corporate structure and down into the ground where it could find reciprocity. At that time, I was 400 pounds, too. So, there was a need in me for life. So, I called Green Thumb and they gave me the contact info for Magnolia. I called Magnolia. When I called, the person that answered the phone said, “Well, I really like what you’re saying but I just want you to know that this is a really hard place. No one comes here. No one is interested in the programs that happen here. So, I want you to know that upfront. But I think it’s a great idea if you would join the garden.” So, I joined. But I didn’t join as some officer. For two or three years I spent all my time just picking up trash, tending to the plants, and listening to the plants for the first time. I had never had that opportunity as an African to be in a position to study the plant, from the plants. So, the trees told me a lot about the history of the space. The people told me a lot about what they knew of the space, and then I began to serve more fully. We are fortunate indeed for Farmer Yon.